What would have happened if a non-Muslim customer was about to buy a can or two of his or her favourite alcoholic beverage just at the time when the religious thugs were creating “something” positive” in the Kampung Manjoi convenience store? Supposing a fight broke out, which could happen when someone is denied one’s right to purchase legally sold goods. Messages would be passed on social media and soon, a group of religious thugs would have got exactly what they wanted, a clash of values in a small kampung which would have blown up because they know when it comes to Islam, nobody in authority wants to stand up to religious thuggery less they are painted as being soft on Islamic values. What should be troubling for people who voted for “ubah” is that this the same script (as Umno) is used by the Pakatan Harapan federal government when it comes to these kinds of religious issues. Where is the condemnation by Harapan political operatives? Where are the reassurances by Harapan top guns that the rule of law trumps supposed Muslim sensitivities? Where are the numerous posts on social media by trigger-happy Harapan politicians about how this kind of thuggish behaviour in the name of religion is not acceptable in this great diverse country of ours? Where are the moderate Islamic politicians who always seem to go silent when it comes to incidents which put them on the opposite side – or at least it should – of the religious extremists in this country? Whenever something like this happened during the Umno regime, the opposition now establishment politicians would blame Umno and the federal government for encouraging such incidents. Now that the opposition is the federal government, why is there no action or condemnation from the very people who claimed that they were saving us from this horse manure. Instead, people blame the alleged outsourced Umno thugs instead of putting the blame not only the Perak menteri besar, but most importantly Harapan top guns, who claimed that under them, issues like these would be solved in a fair and just manner. Oh, I am sure people would throw up hundreds of excuses or justifications for silence. Now that the Perak police have opened an “investigation”, some people would like to go back to the bigger issues facing this country. How sickening. Opening an investigation? That video clip is evidence of a crime being committed. The perpetrators should be in a police lock-up and awaiting charges instead of basking in their fame. What other evidence do you need? Okay, say you have video footage of someone breaking into your house, would the police need to open an investigation before apprehending the culprits? What exactly needs to be investigated? What exactly needs to be discovered? More importantly, why has the federal Harapan government not made any official overtures to the Perak state warning them that this kind of inaction would not stand. This, after all, is a question of national security. 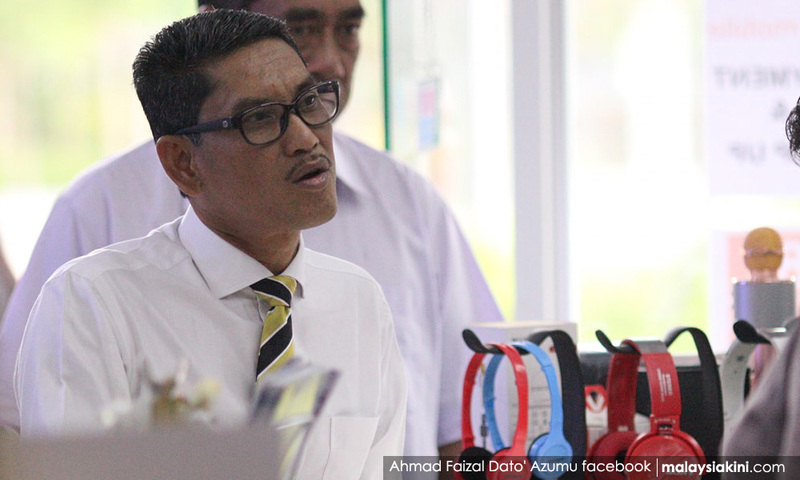 The most shocking aspect of this incident is the words of Perak Menteri Besar Ahmad Faizal Azumu (photo) when “he also advised other shop operators operating in other Malay villages to be more sensitive to the feeling of locals." And this does not merit an official response from the Harapan federal government? Do not make the mistake of thinking that the main targets of these religious extremists were the non-Malay community. No, the real targets of those extremists are the Malay-Muslim community. What they are attempting to do is control the narrative of Islam in this country. They are aided and abetted by the political apparatus as demonstrated by the soft warning of the Perak MB and the silence of the federal government, including the normally boisterous non-Muslim politicians. This comes at an especially dangerous time. Because the Umno hegemon which has been the defender of ‘bangsa’ and ‘agama’ for decades and because an organisation like Bersatu which has claimed it can do a better job has somewhat replaced it, this is a test case for the religious extremists in this country as to how far they can go. How far is this talk of moderation and inclusion by the Harapan regime is genuine or just more political horse manure? While the Perak MB is an easy target, the real power to halt such forms of religious extremism is the federal government. When Umno was in charge this was exactly the line of attack used by the then opposition whenever incidents of religious extremism flared up. There was a political motive behind this incident but it is simplistically to merely blame it on the machinations of Umno. What we are dealing with is the control of the Islamic narrative in this country. So-called moderate Muslim political operatives are unmasked as the toothless tigers that they are if they do not resist such attempts by the Islamists to control the Islamic narrative in this country. Where is the counter-narrative from the federal government? Where is the narrative that reinforces the idea that just because you disguise your extremism in religious piety it does not mean you are above the law? Where is the narrative from the federal government, making it very clear that actions of religious NGOs which goes against the law and is a threat to citizens will not only suffer repercussions from the state but would also suffer the sanctions from the federal government? This would have been an ideal opportunity to discuss regulations on these so-called Islamic NGOs and a revamp of state and federal religious bodies so they do not encourage an atmosphere where religious extremists harass legally-run business and expect no sanction because they claim to be religious people. This is not like the kind of intimidation by the red shirts. This has been happening in this country even in some opposition-controlled states. This is about who controls the mainstream Islamic narrative in this country. This incident will not only test the sincerity of Harapan in tacking an issue which is the existential threat to this country but also its commitment to a Malaysia free from religious extremism and bigotry. Or maybe ‘Tiang Seri’ is the new Ketuanan Melayu in this BN Redux.